In lieu of the Darwin Award (since the perpetrator did not die), this qualifies as a candidate for the 2019 Stupid Award. 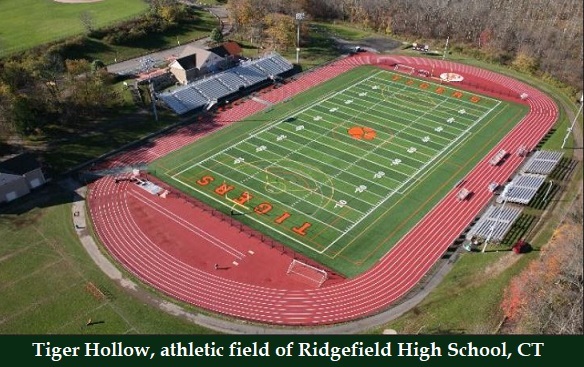 Some bright bulb at Ridgefield High School, a public high school in Ridgefield, Connecticut, had the ingenious idea of setting fire to the school’s rain-soaked baseball field, Tiger Hollow, with 24 gallons of gasoline so as to dry and warm it up before a game. WDBJ CBS7 reports that according to Ridefield police, on the morning of Saturday, April 7, 2019, the baseball field of Ridgefield High School was set on fire in a reported attempt to warm up the infield before a game. Video shot by a teacher reportedly shows the moment after 24 gallons of gasoline were poured on the infield and set ablaze. When the fire started burning, someone among the families gathered at the field ran across the street to the police department and notified authorities.